Members of the Fairfield Public Library's "One Book, One Town" selection committee wondered for months what book they should choose for this year's community reading initiative. They struggled as they read through and considered 30 titles for the sixth annual program until Librarian Claudia Silk brought to their attention "Wonder," R.J. Palacio's New York Times' best-selling debut novel. "Everybody read it and said, `This is the one we've been waiting for,'" Silk said. "I love this book so much. You feel like this book could make a difference. If everyone read this book the world would be a better place," Silk said. "A lot of life experience, a lot of librarian knowledge and a lot of love goes into picking the book," said Bob Sussman, treasurer of the Fairfield Public Library's Board of Trustees. The selection was announced Thursday at the main library, where staff wore T-shirts emblazoned with the words, "Choose Kindness." Those words are pivotal to the plot of the book. The novel centers on the themes of acceptance, civility, celebrating personal differences and choosing to be kind to each other. "The message of the book is all about choosing kindness. It is a very powerful and positive message, and also in light of recent events, especially in Connecticut," Palacio said Friday, referring to the massacre of 26 people, including 20 children at Sandy Hook Elementary School in Newtown on Dec. 14. "I think sometimes a book will just hit at the right time for a community or people at large, or the world. The book has been translated into 29 languages. It seems to have resonated," the author said in a telephone interview. The popularity of "Wonder" has surprised its author. "It isn't about werewolves, it isn't about vampires ... Even in my wildest dreams I don't think I would have ever imagined the reaction that it's engendered. It's been pretty amazing. I'm still sort of breathless about it," she said. But staff at the library is not surprised by the book's success. Teen Librarian Nicole Scherer said the choice has generated quite a bit of excitement. "It's the most popular book we've ever chosen before we chose it," explaining that "Wonder" is No. 1 on the New York Times' middle grade list and was in the Top 10 of all children's books sold last year. It is also the first book by a female author chosen for Fairfield's One Book, One Town. A chance encounter with a disfigured child and then coincidentally hearing the Natalie Merchant song, "Wonder," on the radio later that same day provided the motivation behind "Wonder," Palacio said. "We were at an ice cream store and we had a very brief encounter with a child who had a very severe cranial facial difference very similar to the one that (protagonist) Auggie has in the book. It was our reaction to her and the graciousness with which her mother responded to us got me to thinking how remarkable these people are and what life must be like for them; wherever they go to constantly be dealing with stares and people who don't understand and look away, especially if you're a child," Palacio said. She said she was also thinking about the impact of kindness because her older son had just finished fifth grade, "and middle school is such a tough time. There was no bullying or anything like that. I did, as a parent, watch these kids navigate these choices that they would make daily in terms of how they treat one another," she said. Palacio said she feels people need to stress the kindness factor. "Not just grades and not just athletic prowess," she said. "Wonder" was chosen by the committee last September, but little did organizers realize how relevant that choice would be. It was a month later that Superstorm Sandy walloped the Fairfield coast, displacing residents in need of the kindness of strangers. And December brought the devastating massacre of 20 first graders and six adult educators at Sandy Hook Elementary School. Kindness is the antidote to the horrible acts that have occurred, not just in Newtown but throughout the nation, Palacio said. "The answer to them does seem to be people coming around and comforting one another and choosing to be kind in a way that's unprecedented in the way we all just rallied. "I do think kindness is the antidote to all our ills and I hope that is somehow alleviates some of the heartbreak that's happened recently knowing that kindness does abound and that we are inherently, I think, good," Palacio said. Palacio appreciates the concept of One Book, One Town. "I think it's such an amazing thing to have an entire community gathering around a book and the message of a book at the same time is really extraordinary," she said. 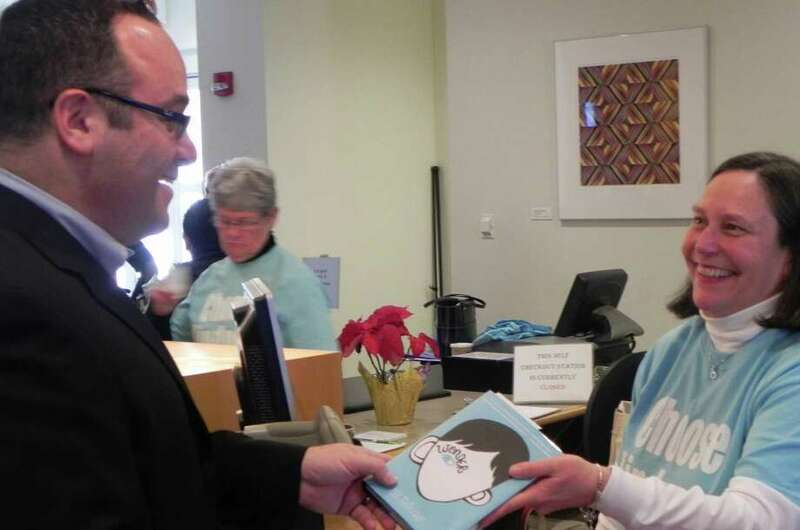 Sussman was the first person to check out the book "Wonder" from the library Thursday, and hopes countless others will do the same over the next few months, culminating with a month of related programs, including a visit by Palacio on March 14 at the Quick Center of Fairfield University. "Whether you're looking to promote a love of reading or looking at it as an escape from the world, and times are hard right now, whatever it is this One Book, One Town really holds a lot of promise and hopefully people will participate. You can be as involved as you want or simply read the book and bring it back to the library," Sussman said.